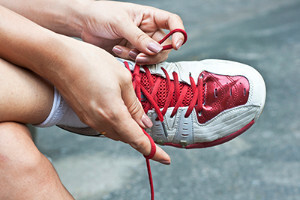 The first step to getting into a proper running routine is to make sure you are wearing the right running shoes. The proper shoe will help to correct biomechanical issues and prevent injury. You should always go to a sneaker store that specializes in running shoes so that the workers can help you find a sneaker that fits your foot strike. There are three main types of runners based on foot strikes: overpronators (when the foot rolls inward too much), neutral pronators (feet roll inward slightly), and supinators (feet don’t roll inward enough). Certain running shoe stores will have you run on a treadmill so that the workers can best determine which shoe type will fit you properly. You will know the shoe is a good fit if you “feel like you want to go run immediately,” said runner Dimity McDowell. If you are a runner, wearing the right running shoe is essential. For more information, contact Dr. Jeff Pawlowski from Red Mountain Footcare. Our doctor can provide the care you need to keep you pain-free and on your feet.